Daytona 2 USA twin driving arcade machine is an arcade racing game released by Sega in 1998 as a follow-up to the extremely successful Daytona USA. In this game players get the opportunity to race some of the best known stock cars around the track at unlimited speeds. Stick the pedal to the metal while zooming through banks and turns. Feel the effects of collisions into walls with the all-new Crash Impact Generator which delivers shocks to the player's back and soles of their feet upon impact, including the feel of the engine's rumble. Daytona 2 USA twin driving arcade machine has superior graphics to the original, utilizing the Sega Model 3 hardware. A notable change from the original is the ability to select a car and corresponding driver, each with varying capabilities for varying levels of player experience. These cars include a Chevrolet Monte Carlo, Pontiac Grand Prix, Ford Thunderbird and a Nissan Skyline GT-R. Just like before, the Daytona 2 USA has three courses – a Beginner course with 8 laps, an Advanced course with 4 laps, and a long Expert course with 2 laps; The 'time lap' mode also returns in this version. Mirrored versions of the tracks can be played as well (another feature carried from the original Daytona) by holding down the Start button when selecting the course. The cabinet features two simulator seats (twin), two 29" monitors, and is able to link up to four players (two units) for tournament modes or just for some extra competition. 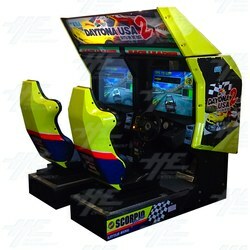 Daytona 2 USA twin driving arcade machine will be a smash hit in any location. Daytona 2 USA twin driving arcade machine is an arcade racing game released by Sega in 1998 as a follow-up to the extremely successful Daytona USA. In this game players get the opportunity to race some of the best known stock cars around the track at unlimited speeds. Stick the pedal to the metal while zooming through banks and turns. Feel the effects of collisions into walls with the all-new Crash Impact Generator which delivers shocks to the player's back and soles of their feet upon impact, including the feel of the engine's rumble. Daytona 2 USA twin driving arcade machine has superior graphics to the original, utilizing the Sega Model 3 hardware. A notable change from the original is the ability to select a car and corresponding driver, each with varying capabilities for varying levels of player experience. These cars include a Chevrolet Monte Carlo, Pontiac Grand Prix, Ford Thunderbird and a Nissan Skyline GT-R.
Just like before, the Daytona 2 USA has three courses – a Beginner course with 8 laps, an Advanced course with 4 laps, and a long Expert course with 2 laps; The 'time lap' mode also returns in this version. Mirrored versions of the tracks can be played as well (another feature carried from the original Daytona) by holding down the Start button when selecting the course. The cabinet features two simulator seats (twin), two 29" monitors, and is able to link up to four players (two units) for tournament modes or just for some extra competition. Daytona 2 USA twin driving arcade machine will be a smash hit in any location. PLEASE NOTE: THIS MACHINE IS BEING SOLD AS-IS AND WITHOUT WARRANTY. INSPECT AT OUR OFFICE/WAREHOUSE ANY TIME DURING OFFICE HOURS.